The French and Indian War took place between 1754 and 1763 in British North America and French North America. These are now the United States and Canada. The French had Native American allies and the British had other Indian allies. The war is called "the seven year war". The conflict was a part of the Seven Years' War among the European great powers including Britain and France, which took place in various parts of the world. Both the British and the French said they owned the Ohio country. This land was between the Appalachian Mountains and the Mississippi River, from the Great Lakes to the Ohio River. France wanted to unite New France, and Britain wanted to prevent that. Both wanted to control the fur trade, and expected to send settlers some day. The British 13 colonies feared control of a pope in North America. France's land was controlled by the French and the Roman Catholic Church. The Protestant British settlers saw this as a threat to their religious freedoms that they had under English law. France built a new fort in the disputed territory and the British decided to expel them. Fighting began with the Battle of Monongahela in 1755. General Edward Braddock, the commander, died with many of his men in a failed attack against the French in what later became Pittsburgh. Militia officer George Washington led the defeated survivors home. The fighting in North America stopped on Sept. 8, 1760 with the surrender of Montreal and all of Canada to Britain. The war ended with the signing of the Treaty of Paris on February 10, 1763. France lost all of its North American lands east of the Mississippi River. All of Canada was given to Britain except for two small islands near Newfoundland. 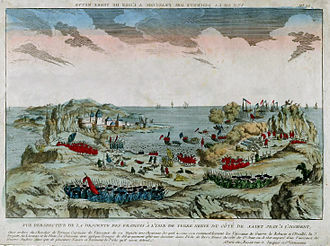 Britain offered France the choice to give up either its Canadian land or the Caribbean islands of Guadeloupe and Martinique, which British troops had taken during the war. France chose to keep the islands, which were valuable for their sugar plantations. With the Royal Proclamation of 1763, British North American colonists became unhappy over their share of the winnings, eventually leading to the American Revolution. Wikimedia Commons has media related to Category:French and Indian War. This page was last changed on 26 March 2019, at 09:07.